Blue Line Drilling Co., L.L.C. was chartered in April 2009 by Jim Phillips, Jerry McDonald and a third partner who was later bought out. While working together for another drilling contractor, Jerry and Jim decided they could do a better and more efficient job if they owned their own company. So, a decision was made to find a rig, get the financing and live the American dream. Their first rig (The Lula Mae) was purchased and hauled to San Angelo from a sandy pine tree pasture in East Texas. And today, just a few years later, Blue Line Drilling is running four rigs with a depth capacity from 2,500 to 10,000 feet. 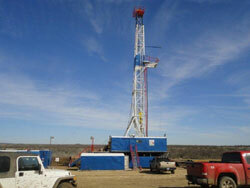 Blue Line Drilling operates in the Eastern Shelf region and the eastern Permian Basin Shelf of Texas. Generally, Blue Line Drilling operations span a 100-200 mile radius of San Angelo , Texas. Blue Line Drilling found a niche working for smaller Independent Operators within a 200 mile radius of San Angelo. Blue Line Drilling prefers drilling on a footage basis but will drill on a day-work or on a turnkey basis. Since the first well was drilled near Big Lake in Dec 2009, Blue Line Drilling has drilled more than 720 wells. With a good, experienced management team, Blue Line Drilling strives to keep their equipment up and their performance at its optimum ability. Blue Line Drilling performs pre-employment, random, post accident, and for cause drug testing without exception. A drug and alcohol free environment is something that Blue Line Drilling takes great pride in providing to all employees. Tragically and suddenly, Partner Jim Phillips passed away in April of 2018. Blue Line Drilling will continue to carry on Jim's legacy in the future. We will all remember Jim each and every day as Blue Line Drilling continues to operate.